Putting their money where their mouth is, Boston Global Investors is moving to the Seaport. They will be moving to Block H along Seaport Boulevard once construction is complete on their 6,00 square foot parcel. 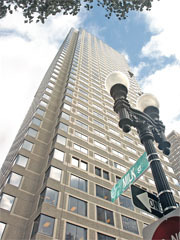 Boston Global Investors will move its headquarters from its current office at 1 Post Office Square in Boston’s Financial District to the Seaport…The firm last week spent $2.21 million to buy a 6,000-square-foot parcel at Seaport Square’s Block H, located along Seaport Boulevard…a four-story office is under construction at the site, and Hynes said Boston Global Investors will relocate there when construction is finished. With the final parcels trading hands last week, Seaport Square’s 23 acres have officially sold for $665.2 million since 2011. The parcels were originally acquired in 2006, in a deal spearheaded by Hynes with financing from Morgan Stanley, for $203.75 million.